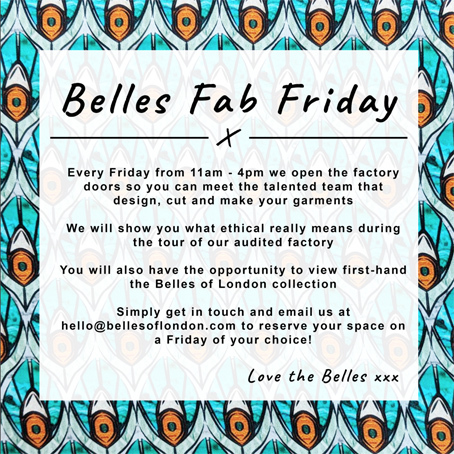 Every Friday from 11am – 4pm we will open the factory doors so you can meet the talented team that design, cut and make your garments. We will show you what ethical fashion really means during the tour of our audited factory. You will also have the opportunity to view first hand the Belles of London collection. Email: hello@bellesoflondon.com to reserve your place. On the twelfth day of Christmas my true love sent to me: special offers and discounts from the FashionCapital team! From 12th December there will be a special offer / discount every day for 12 days across all of our services including membership, masterclasses and Belles of London. 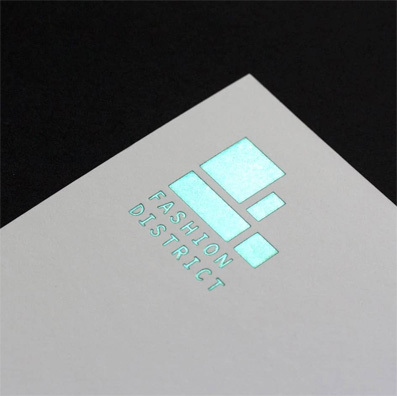 To take advantage follow us on FashionCapital instagram where discount codes will be released each day. It seems like we’ve been banging on about sustainability and ethics in fashion for a number of years now. We’ve heard lots of noise from major retailers but not seen much action, sorry, but a capsule organic collection in the midst of a store full of cheap mass production from the far East just doesn’t cut it! We are striving to show that ethical and sustainable fashion can work right here in the UK and we operate an open door policy to encourage others to see how our factory works. Today, (5th Dec 2018) our CEO Jenny Holloway has been invited back to parliament to attend a discussion on ‘Fashion and Sustainability’ headed by Dr. Lisa Cameron MP Chair of the All Party Group for Textiles and Fashion. This will be the second time this week that Jenny has walked through those Portcullis House doors in Westminster. Yesterday she spoke at a parliamentary briefing introduced by Stephen Timms MP. 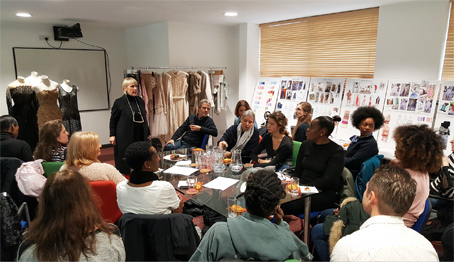 The aim was to engage east and north London MPs on the ambition and direction of the new ten-year strategy towards a London fashion innovation hub – Fashion District, which will include Fashion Enter’s Tailoring Academy. Today, 5th December 2018, industry expert Della Nelson was in for a free ‘meet and greet’ with individuals seeking industry support and mentoring. 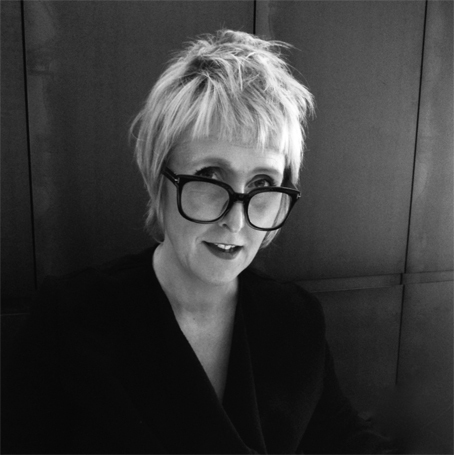 Della has over 30-years industry experience and she has now joined the FashionCapital team of mentors. Her extensive experience and desire to nurture new business startups is an excellent addition to our support services for emerging brands. Come and gain essential industry insight with Della’s three stage masterclasses starting in the New Year. Click on the links to find out more and book. 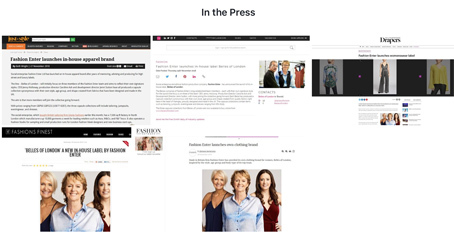 We’ve been hitting those headlines again – this time with our Belles of London launch range. Thanks to Drapers, Just-Style, Fashion Network and Diary. 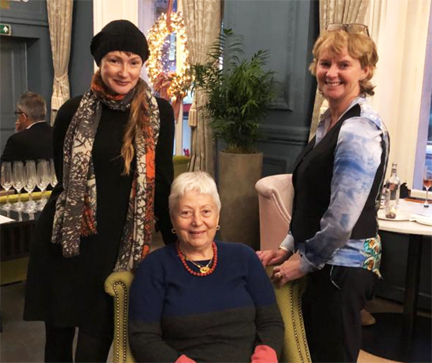 This week Jenny Holloway and editor JoJo Iles met up with pattern and fit expert Anastasia Vouyouka founder of Telestia to discuss tailoring courses for ready-to-wear, bespoke and made-to-measure. With the Tailoring Academy due to open next Spring plans are underway to provide specialist tuition and courses. The meeting also provided the trio the chance to enjoy a pre-Christmas drink! 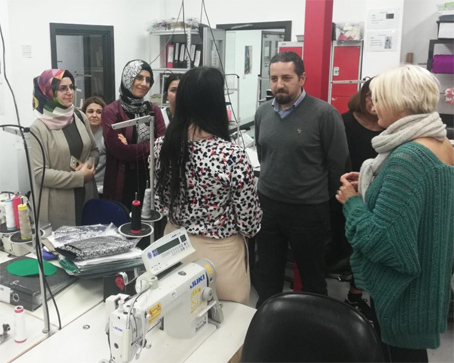 5 vocational High School teachers in Fashion/Textiles from the Erasmus+ Projects in Turkey paid a visit to the FTA and Factory. The aim for the group was to gain insight into the educational structure, facilities and courses available at Fashion Enter. As a part of an exchange programme the teachers will provide their students wishing to further their studies in the UK with direction in fashion and textile courses that are available in the UK. 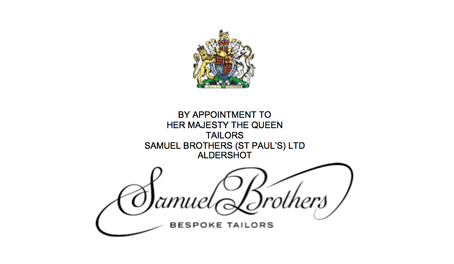 Samuel Brothers Bespoke Tailors require a Sewing Machinist – Coat Maker, full time in Harwich, Essex. Click here to find out more. 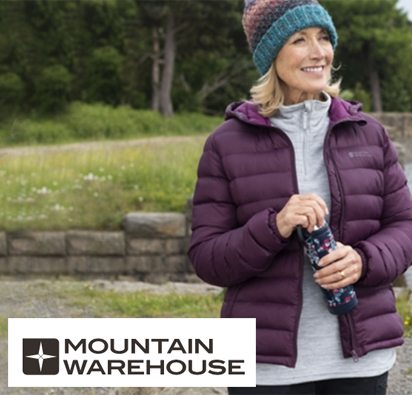 The position for a Garment Tech apprentice is still available at Mountain Warehouse based in London. Please note apprenticeships are open to those over 16-years old and are not in full-time education or former graduates. To find out more and apply click here. How to Build A Successful Brand with Caren Downie 31st January. 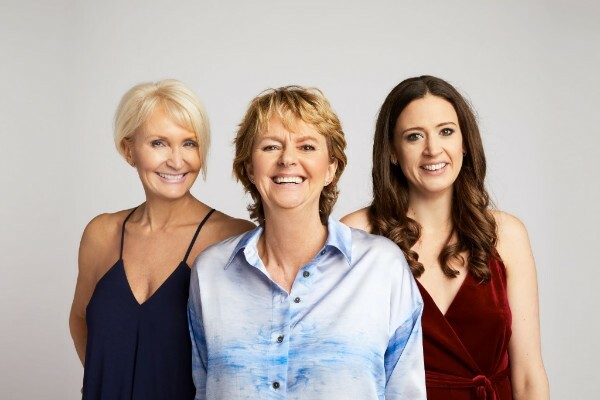 How To Do Your Own PR with Rosie Davis 21st February 2019. Gerber Accumark Digital Pattern Making for Beginners from the 12th January 2019. 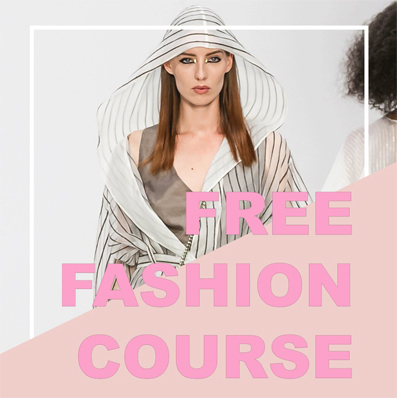 TR Pattern Cutting 2-Day Master Course Stage 1, 25th and 26th January 2019. 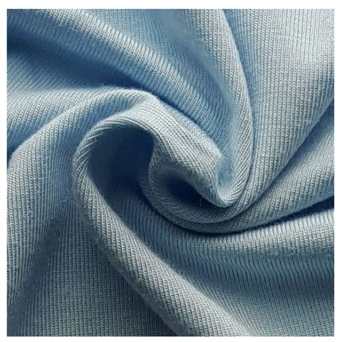 This week we’ve picked out an ice blue jersey a versatile fabric that can be worked into numerous core garments. Available now at £3- a metre from the FCFabric Studio. Fashion Inside Out: Meet Lan Leeder Pattern Cutter at Fashion Enter. Its official; the UK creative industries are growing at a phenomenal rate and that includes fashion. Meet the founder of the ethical streetwear brandOtso Clothing. Each week we will be selecting a beautifully made Belles of London garment created right here in our London Fashion Studio. Which Belle are you? 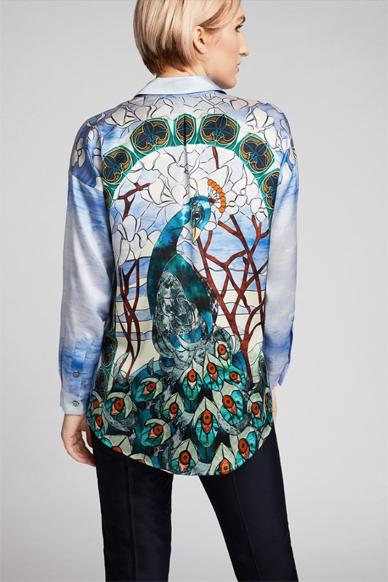 This week we feature the peacock print ‘boyfriend’ silk satin shirt from Jenny’s collection available now in UK sizes 8 to 18 at £160. More from the FashionCapital team next time, until then have a great week!